Perfect for rhythm parts and rich, clear leads. Designed for players who don’t need more output, but seek the sought-after “vintage” Strat sound. The perfect choice for Knopfler, Clapton or Gilmour tones. Uses a mix of Alnico V and Alnico III magnets. Tone Guide: Classic vintage strat tones, great clarity and a less harsh, full-sounding bridge pickup. High-Grade “Smooth-Top” Alnico Polepieces – no sharp edges! Modified stagger polepieces for more accurate string-to-string balance. Tonerider covers in a four colors – Black, Soft White, Mint and Vintage Cream. Calibrated winding for even volume balance across all five standard positions. All sets are RWRP – offering noiseless operation in positions 2 and 4. For Lefties! 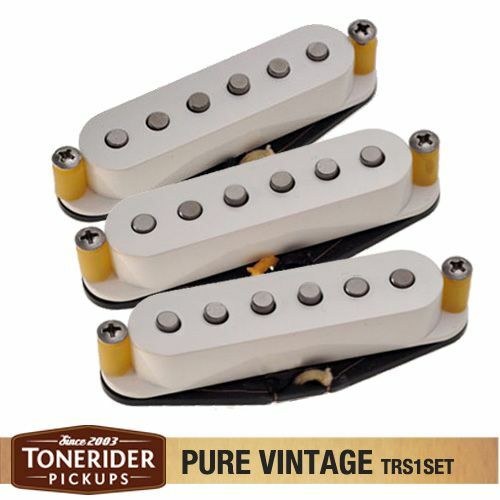 TRS1 Pure Vintage pickups are coming soon in left-handed configurations! 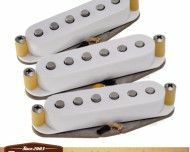 Note: All our stratocaster pickups are available as sets and individually.